Usable fork pockets are 7″ x 2″ on 21-5/8″ centers. Units tilt with assistance from operator handle for dumping contents. Must be attached to fork truck when dumping. Welded construction makes hoppers long lasting. When transporting any bulk materials about a stockroom or warehouse, safety is imperative. The more dependable the method of transit the less likely your worker will have a potentially expensive and wasteful accident. By using a steel hopper forklift attachment and goods on a standard forklift truck, you get the best of both worlds – a system that is easy to manage in terms of loading and unloading. Our forklift hopper attachment is quick, dependable, and able of carrying big amounts of material in one trip around the job site. Model ERHOP-PTD Reduces worker fatigue and injury with this 1/3 cubic yard Power Traction Drive Hopper. This factory installed option makes portable equipment easy to maneuver with its 240° turning radius, handle grip/throttle and auto reverse. This state-of-the-art option allows a single operator to perform tasks safely and ergonomically. Includes built-in electric drive motor and DC battery with on-board charger. Maximum speed is 3 mph. Hopper and fork pockets are included. Fork pockets are 7-1/2”W x 2-1/2”H usable on 18” center. 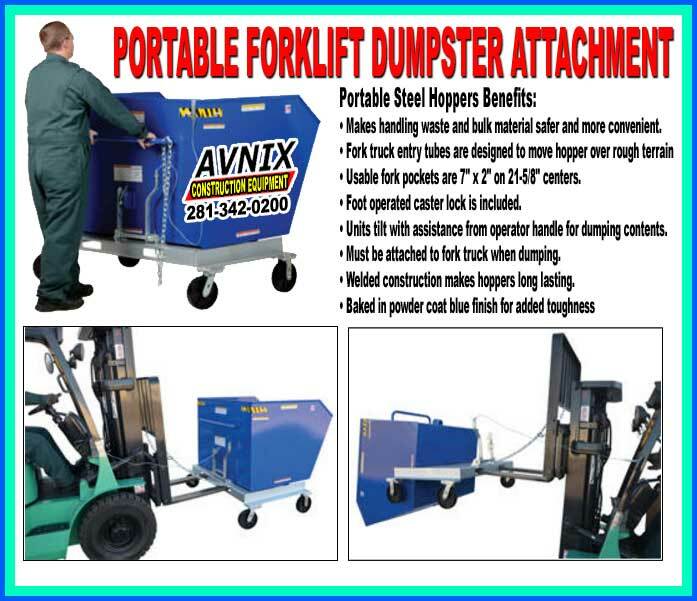 Our forklift dumpster offers your workers the capability to carry loads of material around in one trip, and offers the easiest feasible method of unloading when needed. Our dump hoppers have been planned around a simple gravity boosted hinge, which allows the material of the loaded hopper to be discharged at the pull of a chain or the tap of a button. Thanks to the big load capacity offered by a steel dumping hopper, coupled with the ability to stand on their own when in use, they offer one of the top ways of moving products from one end of a warehouse to another, as well as being a large capacity storage bin in their own right. There are many reasons to use our dump hopper, and they present a lot of value across many different business applications. One of the most useful benefits of our forklift hopper attachment is to move large amounts of chemicals or ingredients from your storage area to the place where they are needed. 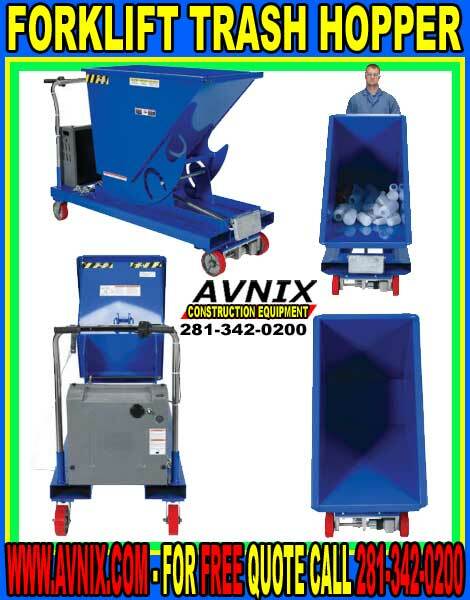 Avnix forklift hoppers can easily be mounted on the front of a forklift truck, and then loaded with whatever material you need to transport. A helpful lid guards against spillage, and the high sides of the forklift hopper are also useful in preventing waste. 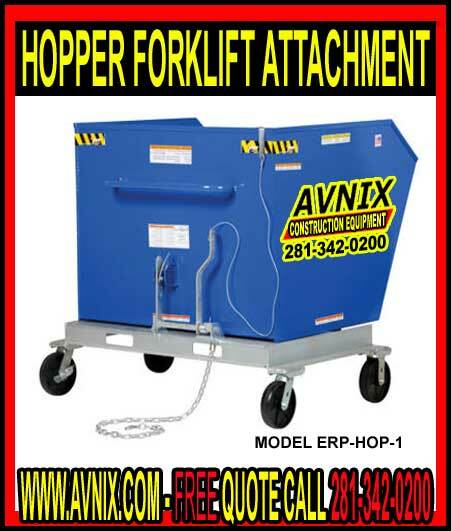 One of the major advantages of a forklift hopper is that it does not need difficult and costly pneumatic systems in order to raise the fully loaded hopper in order to dump the contents. Instead, the normal position of the hopper is in the dumping position, and gravity will automatically pull the hopper forwards when the operator unlocks it. This means that the forklift hopper can be attached to the forklift fast and efficiently, with no extra power requirements or other issues needing to be addressed. 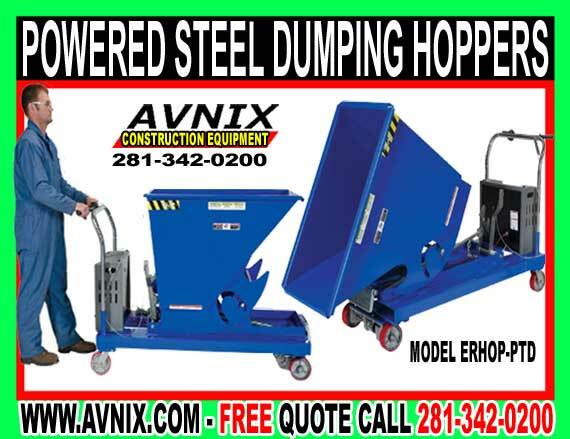 All of our dump hoppers come with a hard long lasting powder coat finish coupled with a high quality steel construction throughout, these dumping steel hoppers are built to last, and offer you the chance to invest in a quality product with a wide range of uses across your workplace that will allow for better efficiency and better management of stock across many areas.